My brother George said that a mulberry tree sprang up overnight at my mom's house. Nobody saw it coming! It is most mysterious. One day there was nothing and the next day there was this mulberry tree as high as the house. And it is full of mulberries. George and the kids have been shaking them down. We believe it is supernatural. So is sure to be the jam I will make from the mulberries. I have never made mulberry jam before. I have never even tasted a mulberry! But someone has to be the first to eat an oyster. Or, in this case, a mulberry. I have been to Mulberry's in Lackawanna so that is a start. Above is a painting of the mulberry tree at my mother's house. 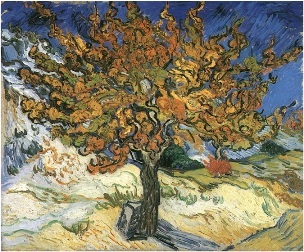 It was painted by a friend of the family, Vincent Van Gogh. There is mulberry wine to be made. You can also make mulberry ice cream. Perhaps I will try that. I was thinking back on the ice cream I used to eat with Leonard at Coldstone Creamery. It is time to crank up the ice cream machine.